I have been looking for a CD copy of this album for years with no luck and I was stoked when it showed up as a CD rip on a mystery forum. Thanks to the original uploader, uheep2, and thanks for permission to share it here. 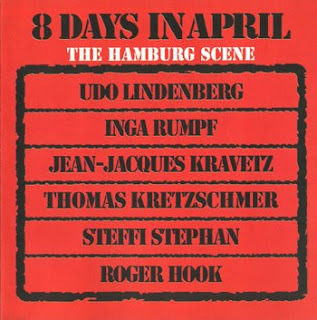 The CD is obviously a bootleg since there has been no official release - "Hamburg" was spelled "Hamnburg" on the back cover (Fixed with Photoshop), but the sound is great. This is basically Frumpy keyboardist Jean-Jacques Kravetz fronting the Udo Lindenberg band, with Lindenberg writing almost all the material. Frumpy singer Inga Rumpf provides vocals for the first track, from then on it's mostly an instrumental album. This is a stellar album of laid-back low-key progressive rock performed by brilliant musicians, with guitarist Thomas Kretzschmer being a real standout! but never mind, it's OK with me...Cheers! Hi lajso - I'm not sure what exactly is OK with you! If you are implying that I poached this from your blog you are wrong. In the first place I never heard of your blog until today. In the second place these are lossless files not mp3. In the third place I posted this in mp3 version 3 years ago in March 2006. I got your mp3 rip year ago and I was really waiting for a lossless post of this awesome album. It's prety amazing and I'm sure you were completely right when you choose your blog's name. thanx a lot, my friend! Very nice project. Excellent stuff! Remember my comment few years ago? Anyway, today I want to ask you if you know where to get Katamaran - Katamaran (1977)? http://rateyourmusic.com/lists/list_view?list_id=82380&show=100&start=100 - so I thought I ask you. So if have a hint where to find it, that would be great! I haven't visited regular since you use lossless formats, but drive by quarterly. Hi Cascade - yeah I remember! On the SFRP forum. Sorry though I don't know anything about that Katamaran album, I've never heard of them. Glad that you check in once in a while. thanks for your reply! So the hunt will go on ... eventually it will show up somewhere. Can't wait to hear this.I love Inga Rumpf's voice.Thank you bigly.Cheers,John From Wales. I was born, raised and still live in this city, the most beautiful of the world. 1972 .... two years earlier till two years later - the best time in my whole life, my god, how much I enjoyed my freedom. thanks for ths wonderful reminder!! Hello John & rog - thanks for taling a moment to leave a comment, much appreciated!